This week’s terrorist attack on French satirical publication Charlie Hebdo sent shockwaves throughout France and the world. 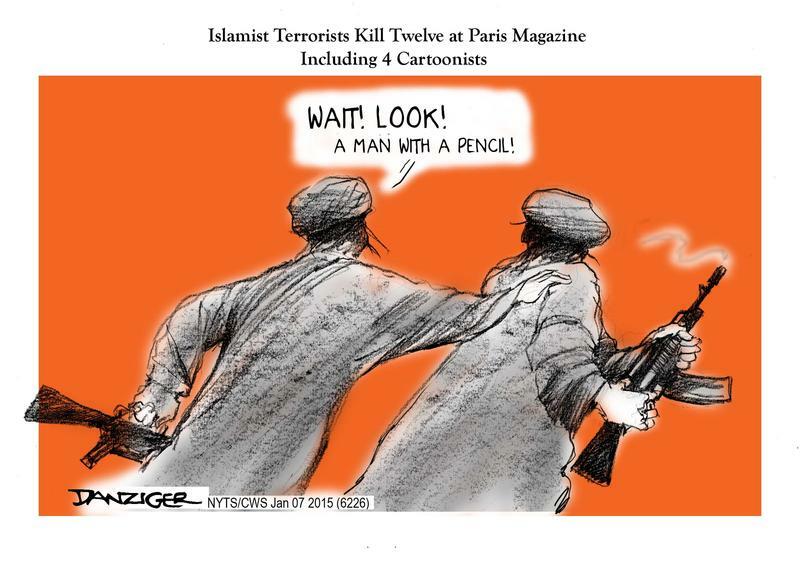 And while any massacre of any humans is horrific and terrifying, this one particularly hit home with cartoonists, satirists and journalists worldwide. The defiant demonstration of solidarity on the streets of Paris, and the electronic reverberations in tens of thousands of “Je suis Charlie” (I am Charlie) posts, are the only heartening aspects of this sad event. Ben Cohen will be teaching a class on comics and illustration this weekend from 11am to 2pm at the Jericho Community Center in Jericho. No experience is needed, with individual and group activities. This class will have a holiday theme, with each student coming out with their own comic. Tuition for the class is $30 at the door. Stay tuned: more classes will be coming over the course of the winter! More details! I’ve got some nice little gift-card slips I can include if you’re ordering for someone other than yourself, and I’ll use one if it looks like you’re ordering a gift. And here’s something else: the first thirty subscriptions ordered during this holiday season will get a nice additional bonus: either our “Greetings from Cartozia” sixteen-postcard set, or a “non-canon” Cartozia story that is published on ten sendable postcards. (The second option is a comic by Isaac Cates and Mike Wenthe that’s part of the secret background of Cartozia Tales.) I’ll enclose these extras as supply allows, but if you want to state a preference, please do. 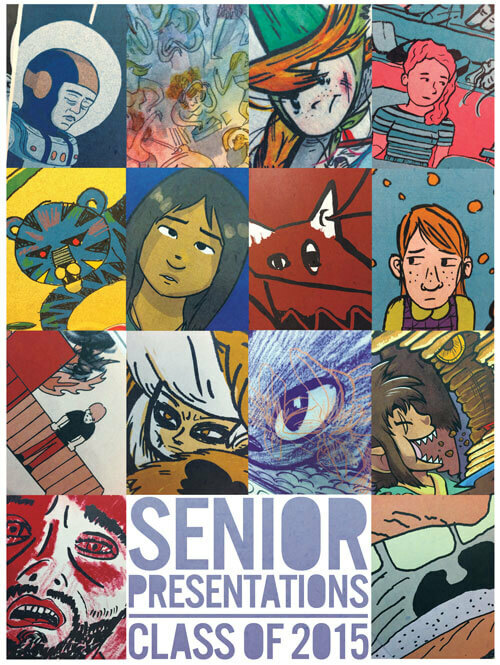 The Center for Cartoon Studies has placed their student’s senior thesis projects up for display in a series of posters at their Colodny Building Gallery in White River Junction. Stop by today to check out what the students are working on! Midterm Thesis Project Posters are on exhibit at The Center for Cartoon Studies in the Colodny Building Gallery, at 94 South Main Street in downtown White River Junction. The posters provide a Midterm synopsis of student projects, featuring artwork and details on the intended final project. On display during White River Junction’s First Friday, December 5, 5-7pm. Take a look on Instagram for some peaks at what’s on display. The Center for Cartoon Studies Portfolio Day! You are invited to join us for our Open House Portfolio Day! Browse The Center for Cartoon Studies SCHULZ LIBRARY! See current student projects, recent alumni publications, and faculty work. Join us for all or part of the day! Prospective students, applicants, college students, high school seniors and graduates, family and friends welcome! 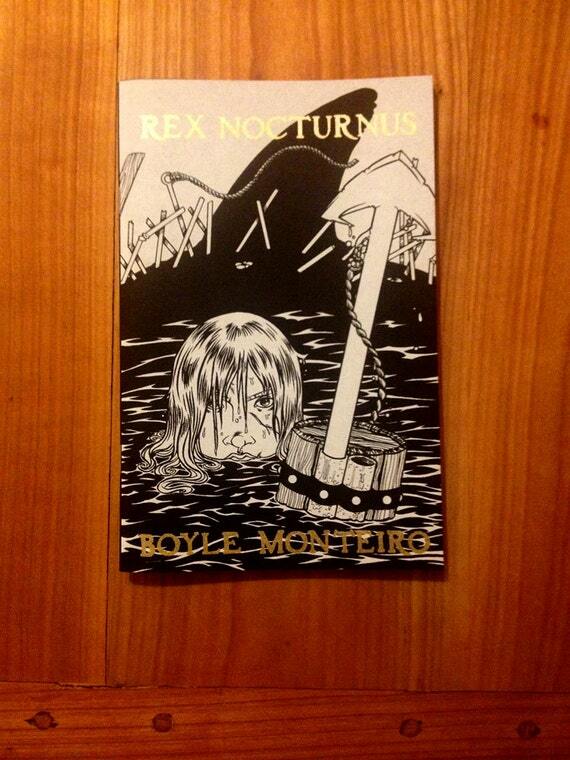 Preorder Scott Monteiro’s Rex Nocturnus! Aboard an aging vessel, the Ocatavia, helmed by Captain Grayson and a small, tight-knit crew, Charly lives the only life she can remember: the Hunt. At a young age she lost her father and half her left arm in a vicious shark attack. Haunted by the loss of the peaceful life she once knew, she replaced her missing hand with a harpoon gun and has been trying to kill the beast ever since. But this is no ordinary shark, this is Rex Nocturnus. “The King” is a legend in this part of the world, feared by all who’ve so much as dipped a toe in the drink. Thought of as a god, the great black shark is whispered to have been roaming the seas for eons. Rex Nocturnus has long been deemed un-killable, a rumor led a large amount of credibility by the scores of broken, rusted harpoons sticking out of it’s back. But you just can’t tell some girls “no”. . .
You can head over to his Etsy page, where you can grab a copy of the comic for $10, as well as a number of prints and limited editions. Last year, local author S.S. Taylor and artist Katherine Roy released a YA novel, The Expeditioners and the Treasure of Drowned Man’s Canyon, which really looked awesome. Now, they’re poised to release the second in the series, The Expeditioners and the Secret of King Triton’s Lair, in September. Looks excellent. It’s set for release on September 23rd, 2014.